FREE Run Boy Run CD with Pre-Ordered Ticket! (limit 1 per pre-purchase order, first 25 orders.) Baur’s will erupt with exceptional bluegrass on June 10 with Run Boy Run. 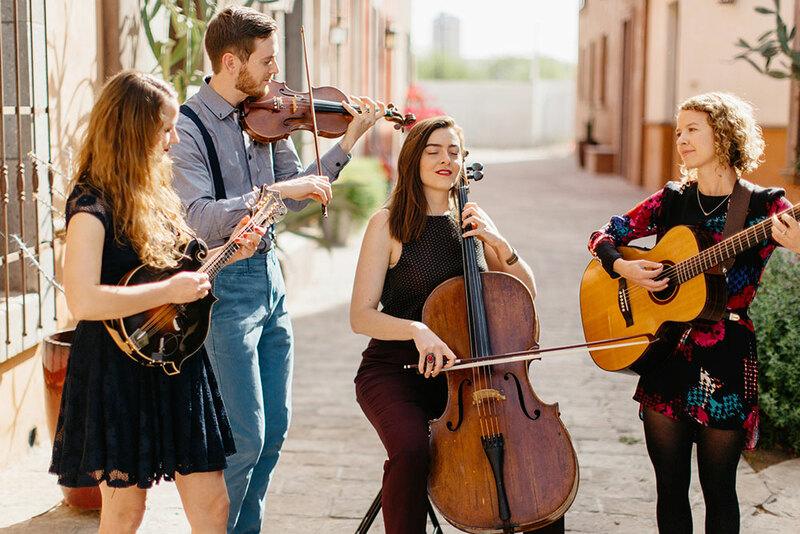 Existing comfortably in the tension between tradition and the musical frontier, Tucson four piece Run Boy Run blends bluegrass, folk and the old timey American vernacular with touches of classical and turn of the century details. Their new album Something to Someone, released October 2015 on Sky Island Records, has been praised by Performer Magazine, All Music Guide, PopMatters, The Guardian, and others. The album was recorded at historic Bear Creek Studios in Wooinville, Washington with producers Ryan Hadlock and Jerry Streeter (The Lumineers, Brandi Carlile, Elephant Revival), whose attention to detail shines in Run Boy Run’s multi-voiced and multi-stringed arrangements. It’s no surprise that the band counts Garrison Keillor of NPR’s ‘A Priairie Home Companion’ and renowned Irish fiddler Kevin Burke among their growing legion of fans. The band is brother and sister Matt Rolland (fiddle, guitar) and Grace Rolland (cello, vocals) and sisters Bekah Sandoval Rolland (fiddle, vocals) and Jen Sandoval (mandolin, vocals). With three strong female voices, singing separately or in harmony, and deeply rooted familial connection to traditional American music, Run Boy Run didn’t come lately to their sound; it’s in their collective blood. On these tour dates, Ryan Alfred (Sweet Ghosts, ex-Calexico) will play bass. You’ll want to be part of this sensational bluegrass evening as Run Boy Run fills Baur’s Listening Lounge with their bold instrumentation and vocals. This lively performance will have you moving in your seats and up dancing on your feet. “Run Folks Run” to Baur’s on June 10 for this exclusive Denver performance by Run Boy Run.